This document is addressed to manufacturers of solar thermal systems. 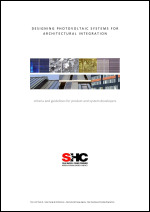 It describes the main criteria for a successful integration of solar thermal systems in buildings and proposes a methodology for the design of systems specifically conceived for building integration. 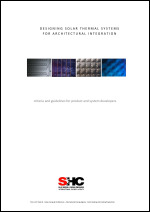 For each specific sub-technology, it provides a comprehensive set of practical recommendations that should lead to the production of new systems appealing to architects. 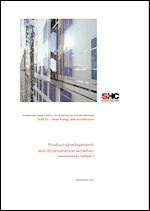 This document shows product developments and dissemination activities carried out within the framework of, or in close relation to, the project IEA SHC Task 41; Solar Energy and Architecture. This Task gathered researchers and practicing architects from 14 countries in the three year project whose aim was to identify the obstacles architects are facing when incorporating solar design in their projects, to provide resources for overcoming these barriers and to help improving architects’ communication with other stakeholders in the design of solar buildings. Participating countries were Australia, Austria, Belgium, Canada, Denmark, Germany, Italy, Norway, Portugal, Republic of Korea, Singapore, Spain, Sweden and Switzerland. The report gives not a complete list of activities, but shows the different types of activities to spread the findings in Task 41 and to initiate product developments in participating countries. 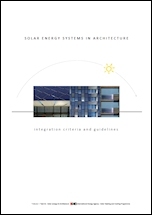 This first report of Subtask A describes the results of a large international survey on the reasons why architects do not use or rarely use solar technologies, and gives proposals to help overcome these barriers by identifying the architect’s needs in this area.